MAS stock the full range of standard hand punches for designers working on leather, paper, plastics, fabrics and other media. The hand punches are made from hardened and tempered carbon steel and are for use with a hammer, allowing designers to punch accurate holes when working on a pattern. Simply provide the punch catalogue number when placing the order. 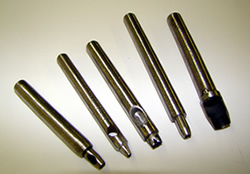 For bespoke hand punches MAS can create a press knife and attach this to the usual hollow tube used in hand punches, creating a unique hand punch for your design. MAS can also provide hand punches as aphabet letters shaped from dots for people wishing to add lettering to belts etc in the form of studs.